Nestle Carnation Evaporated Milk with Vitamin D Added - The cooking milk. Use Carnation in all your cooking and baking recipes to make them taste their best. Use equal amount of Carnation in place of whole milk or half and half milk for rich and creamy results. 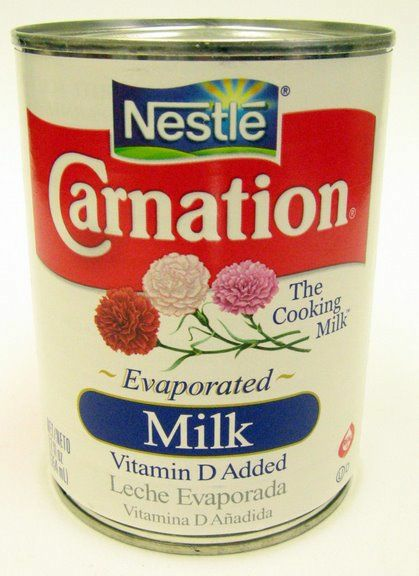 Utiliza la leche Carnation o leche Clavel en igual cantidad que la leche entera o descremada sin agregar agua para preparar tus recetas y platillos favoritos. Utiliza la leche evaporada Carnation para preparar un delicioso dulce de mango con leche evaporada clavel.